Justin Donovan Houston (born January 21, 1989) is an American football outside linebacker for the Kansas City Chiefs of the National Football League (NFL). He played college football at Georgia, where he earned All-American honors, and was drafted by the Chiefs in the third round of the 2011 NFL Draft. Houston attended Class AAAA Statesboro High School in Statesboro, Georgia, where he was a two-time All-Region selection and All-State honorable mention. He also played in three State Championships in 2003, 2004, and 2005. Statesboro won the State Championship in 2005 defeating Northside High School. He was teammates with fellow Georgia recruit DeAngelo Tyson. Regarded as a four-star recruit by Rivals.com, Houston was listed as the No. 11 weakside defensive end in the class of 2007. As a sophomore at the University of Georgia in 2009, Houston was a second team all-SEC selection after recording 7.5 sacks. As a junior, Houston recorded 10 sacks, leading all linebackers in the SEC, and only second to Auburn's Nick Fairley who had 11.5 sacks as part of the defensive line, and was a first team all SEC selection and an All-American. Houston was drafted 70th overall, in the third round, by the Kansas City Chiefs in the 2011 NFL Draft. Houston was originally projected to be a late first round pick, but it was reported that he tested positive for marijuana at the NFL Combine in February, which dropped him to the third round. After his rookie season Houston had 5.5 sacks and 49 tackles. His impressive play would lead him to win the Chiefs Mack Lee Hill Award. In week 6 of the 2012 NFL season, Houston had his first interception in his career. After the 2012 season, Houston was invited to his first Pro Bowl after Von Miller was reported injured. On May 30, 2013, Houston was named the 49th best player in the NFL according to NFL: The Top 100 Players of 2013, which is generated by the players. Houston led the NFL in sacks in 2014 with 22, nearly breaking Michael Strahan's single season record of 22.5. This included a four-sack, five-tackle performance with a forced fumble in the season finale. On March 3, 2015, the Chiefs placed a non-exclusive franchise tag, worth $13.195 million, on Houston, meaning that he can negotiate with other teams, but the Chiefs have the right to match any offer, or receive two first-round picks as compensation. On July 15, 2015, hours before the deadline for long-term deals on franchise players, the Chiefs signed Houston to a six-year contract worth $101 million. The deal includes $52.5 million in guarantees. 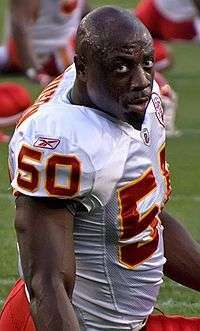 Justin Houston marked seven and a half sacks on the season, but the fact was overtaken as he needed a ACL surgery, which occurred in February. It was questionable whether he would play in 2016. ↑ "Weakside defensive ends 2007". Rivals.com. January 25, 2007. ↑ Emerson, Seth (April 29, 2011). "Georgia's Houston Taken by Chiefs". McClatchy Newspapers. Retrieved May 1, 2011. ↑ "Kansas City Chiefs franchise tag Justin Houston". National Football League. Retrieved 3 March 2015. ↑ "Justin Houston Stats". ESPN. ESPN Internet Ventures. Retrieved 9 February 2016.